Just tweeted congrats to DPW on BTV's first cycle track, now in place from Main to Buell on S. Union, set to be completed north to N. Winooski. The facility to be permanent. 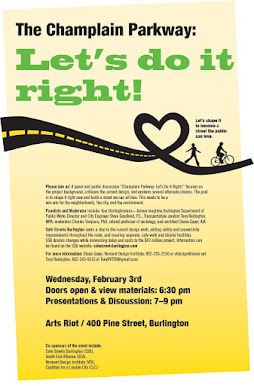 New BTV Union St (Main-N. Winooski) cycle track scores perfect 10! Treatment cures vehicles invading cycle space. Congrats BTV DPW! Sorry, but one cannot help but also point out the sorry state of pedestrian safety and note bicyclists get something first while pedestrian safety and service at intersections gets to eat cake--no best practice roundabouts...yet! With 20,000 excess highway deaths compared to the safety performance of top nations (US was once number one) consider the following analysis. This analysis done BEFORE the 14% spike in highway fatalities, largest in half century in 2015-2016, explains how we moved three miles an hour on safety on a four miles an hour treadmill forward set by other modern nations (and no so modern ones too). Really nice charts on U.S. versus other nations over time. Dove from number one about 1990 to 16th today. For us here in Chittenden County and Burlington we know, for example, since about 1990 when the U.S. was tied with UK for number one in highway safety there has not been a single safe busy street intersection installed in the County. Also, the $35 million Parkway not only does not have a single safe intersection, and the addition of six new signalized intersections promises about eight additional injuries per year to neighborhood residents and visitors over today's "best safety practice." Numerous comments also of interest.